I’m proud to offer these practical, accurate, up-to-date birding checklists for Southeast Arizona, with my compliments, on behalf of Fun Birding Tours. A handy field checklist, specific to each month, including every bird you’re likely to see plus the more regularly occurring rarities. A long-form, full checklist with every species ever recorded in Southeast Arizona. They’re all in PDF format, ready for printing, plus the full checklist is also available as a spreadsheet in Excel (XLS) format. The following information will help, but to make your life easier, and to see more birds, hire Richard as your expert SE Arizona birding guide. These monthly checklists are specially designed to meet the needs of birders in the field in Southeast Arizona. They are all a single page (double-sided) and, when printed on medium to heavy paper and folded in four, they make an attractive and practical booklet for use in the field. The checklists include all the regular species you’re likely to see during the month, plus many of the rarer ones too. The order follows the latest ABA (American Birding Association) Checklist. The status details are based on those in Tucson Audubon Society’s Finding Birds in Southeast Arizona, with some amendments to improve accuracy in the field. The status for each species is very precise, stating whether a bird is common, uncommon, rare or accidental, for each week of the month, making your ‘expected list’ very easy to define. You can use one checklist per site, one per day, one for your whole trip, or just use them as a reference, whichever works best for you. There’s a space under each family to add an extra species, plus a few spaces at the end in most months. 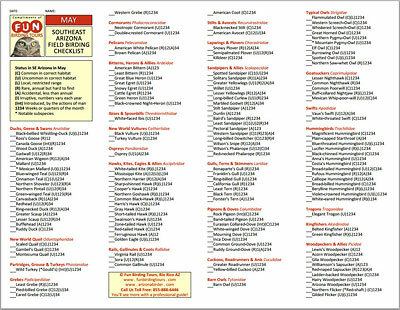 This checklist contains every species recorded in Southeast Arizona, plus significant subspecies, with brief status details. It runs to 15 or 16 pages of letter-size paper (or 8 if printed double-sided). There are three versions: a single day checklist with space for notes for each species, a four day checklist with a small space for notes for each species, and a seven-day checklist with no space for notes for each species. Each version has space for adding up totals, ‘bird of the day’ and additional notes, as well as a list of notable mammals and reptiles with ample space to add more species. 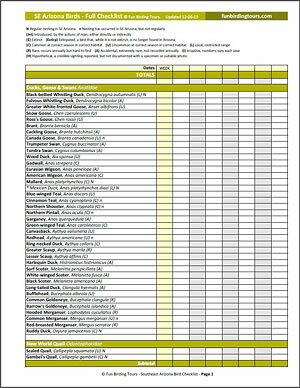 The single day checklist has columns for birds seen and for birds that were heard only, and space to list the major birding sites. The multiple-day checklists have a column for each day plus a trip column, space at the top of each page to keep track of the dates for each column, and zebra-striping to make the columns easier to follow. The PDF versions are intended to be printed and filled out by hand. You can enter your data in the XLS versions and they will total up the number of species for you (as long as you put a 1 for each species you’ve seen). The information above will help, but to make your life easier, and to see more birds, hire Richard as your expert SE Arizona birding guide.